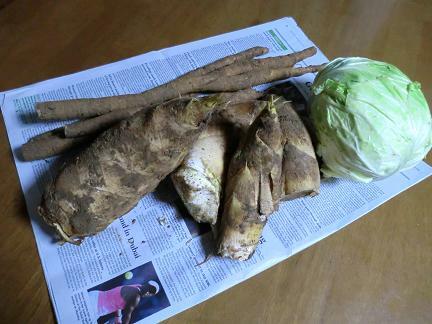 I got burdock roots, bamboo shoots and a head of cabbage from my acquaintance. Thank you so much! I am the happiest when I get vegetables like this. Both burdocks and bamboo shoots have soil on them. How fresh ! They are more valuable for me than any expensive food. By the way, I heard it is very good for us to eat food high in fiber in spring because fiber helps our bodies to eliminate the waste and toxins which collected in winter. When I was a child, I did not really like food high in fiber. Fortunately, there was not so much waste and toxins in my body then, I think. However, now I undoubtedly should eat fiberous food a lot. Oh, spring to eliminate the toxins for me!